Hello again from Sakai, Japan. We pray that this newsletter finds you well and looking forward to a wonderful summer. As we are busy preparing for our visit to the States this summer, we want to quickly update you on what is happening at Sakai International Bible Church. 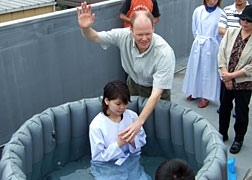 In late May we held another baptism celebration on the roof of the church. This time five people took this important step of faith. The weather was perfect and the testimonies were encouraging as we heard the simple stories of lives that have been transformed by faith in Jesus Christ. Please pray for the two young women, Hisae and Yui, and the three Sunday school boys, Ken, Hikaru and Yuki, as they continue to grow as lovers of God and followers of Jesus Christ. We have seen some real encouraging growth at the church in these last few months. Besides the baptisms, the Lord has also led a number of new people to make SIBC their church home. We thank God for the growth, but are now faced with the problems of not enough space and not enough man-power to handle the growing needs of the ministry. Please pray that God would supply our every need according to his glorious riches. 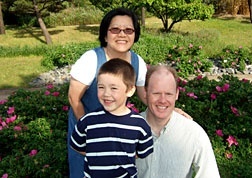 Please also pray for the church leaders: Shibuya, Noji and Kajihara. It is not easy for them to cover all of the responsibilities of the church while we are away, but we appreciate their willingness to serve in this way. Pray especially that they would be able to provide spiritual leadership in the church and that the Lord would maintain the forward momentum of the last few months. One of the keys to our recent growth has been our commitment to prayer. Please pray that the weekly prayer meetings (Wednesday and Sunday) would also continue strong. As we mentioned in our last letter, in late June we will be returning home for an 8-week visit. After a week at Mount Hermon, we will spend July visiting those churches that we were not able to visit in 2004. We will then spend two weeks in August with Michael’s family up in Portland and Spokane. Please pray for us as it will be a very busy and hectic summer. Pray especially that we would be an encouragement to many people as we share about the Lord’s work here in Sakai. Finally, here is our tentative schedule. If you are in the Los Angeles area and are able to make it to any of these churches, we would love to be able to meet with you. Each time that we return to the States for a time of home ministry it causes us to reflect on the previous two years of ministry. As we look back at 2005 and 2006, we are grateful for the Lord’s blessing on our lives and ministry here in Japan. Though our ultimate praise belongs to the Lord, we know that much of this blessing is a direct result of your involvement in our ministry. Your prayers and financial support have both encouraged our hearts and blessed the work at SIBC. From our hearts to yours, thank you for all that you have done for us. We greatly appreciate you. Well, we hope to see many of you in a few weeks.